When you live in Manhattan, it is easy to lose perspective on the fact that it is, indeed, an island with all sorts of natural attributes of an island. That's one of the fun things about flying out of La Guardia, you do get some really awesome views that make the hulking bridges look like little toys and allow you to see all the places it takes you so much time to get to on the ground. This photo provides an awesome perspective of the island, with the looming presence of Staten Island and the Raritan Bay beyond. You can tell this was taken during the winter due to all the snow on the reservoir in Central Park, and the Lower East Side, which is easy to forget about unless you live there, is very obvious. If you've ever driven to Manhattan from the south, you know that you can get into New York City about an hour earlier than otherwise if you want to take the Verrazano Narrows Bridge, which you can't even see in this shot. 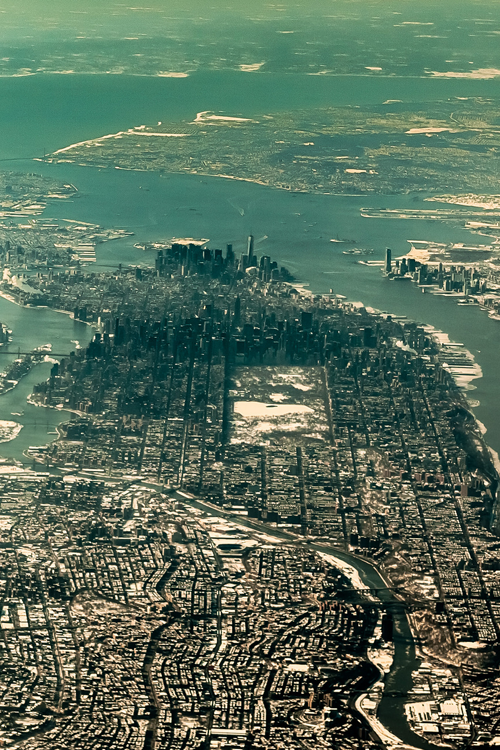 Anyway, it's a great shot and shows you what New York really is all about.